Before going through this tutorial take a look at the overview section. 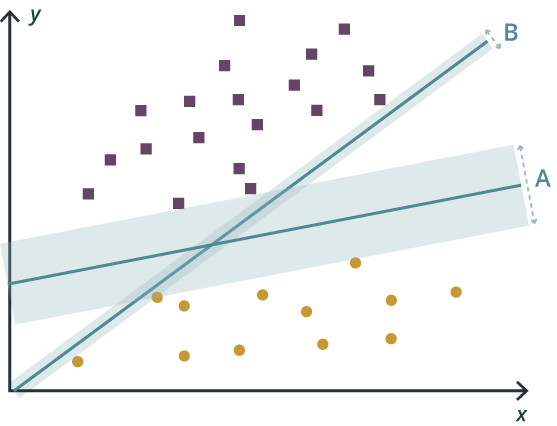 In machine learning, support vector machines (SVM) are supervised learning models with associated learning algorithms that analyze data used for classification and regression analysis. Given a set of training examples, each is marked as belonging to one or the other of two categories, an SVM training algorithm builds a model that assigns new examples to one category or the other, making it a non-probabilistic binary linear classifier. An SVM model is a representation of the examples as points in space, mapped so that the examples of the separate categories are divided by a clear gap that is as wide as possible. New examples are then mapped into that same space and are predicted to belong to a category based on which side of the gap they fall. In addition to performing linear classification, SVMs can efficiently perform a non-linear classification using what is called the kernel trick, implicitly mapping their inputs into high-dimensional feature spaces. In this tutorial, Harp won’t touch the core code base of computing SVM. It will use LibSVM, which is an open source library and does parallel around LibSVM. And it is developed at the National Taiwan University and written in C++ with other programming languages’ APIs. LibSVM implements the SMO algorithm for kernelized support vector machines (SVMs), supporting classification and regression. The training set of the algorithm is split into subsets. 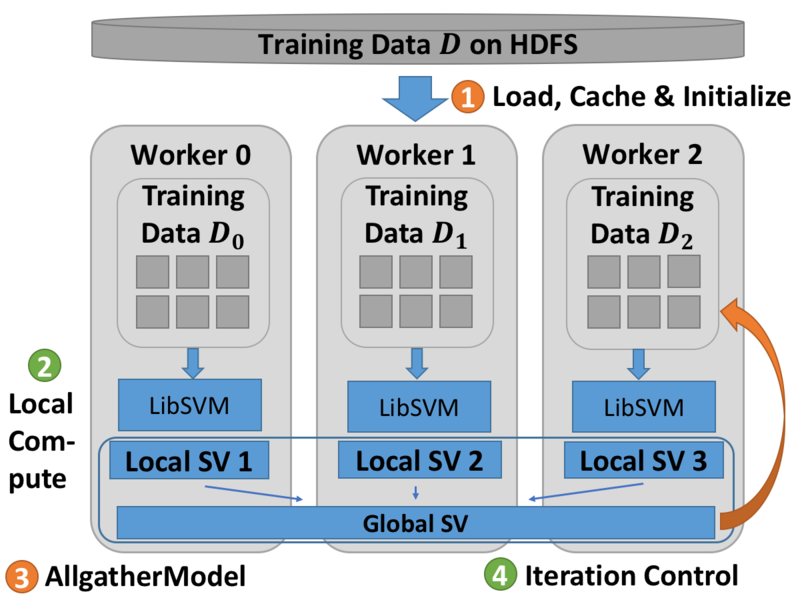 Each node trains sub dataset locally via LibSVM’s API. Allgather support vectors to global. Each node combines its training data and the global support vectors. Repeat Step 2 to 4 until support vectors don’t change any more. The source code can be found in Harp GitHub repository by click Harp SVM. The dataset used is a subset of (MNIST)[https://www.csie.ntu.edu.tw/~cjlin/libsvmtools/datasets/multiclass.html#mnist] with 6000 examples selected. The result is the support vectors.